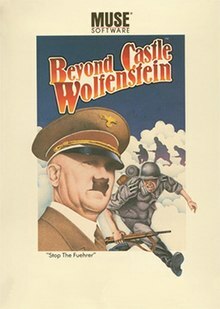 Like its predecessor, Beyond Castle Wolfenstein is a combination action and adventure game with stealth elements. It is set in World War II during Adolf Hitler's rule as Chancellor of Germany. The objective of the game is to traverse all the levels of the secret Berlin bunker where the Führer is holding secret meetings with his senior staff. The player must retrieve a bomb that the operatives have placed inside the bunker and place it outside the door of the room where Hitler is holding his meeting, a scenario bearing a passing resemblance to the July 20 Plot. The game features a top-down view of each room on the level, though the characters are seen upright like in a side-scroller. The player tries to traverse the levels by sneaking by, impersonating and sometimes killing opponents. The game is controlled via a joystick, paddles, or the keyboard. Although the keyboard is the only option that allows for all commands. The player successfully completes the game after planting the bomb and escaping the bunker before it explodes. The game is similar to its predecessor, but features a number of gameplay updates. The guards now use a pass system, in which the player is periodically summoned by guards and asked to show the correct pass (which varies by floor), or offer a bribe. If an incorrect pass is shown or the bribe is rejected due to the lack of money (for a total of two times), the guard will attempt to activate a bunker-wide alarm or kill the player. The bodies of dead guards can be dragged through the room to conceal them, block passages, or gain access to objects. The highly explosive grenades of the previous game have been replaced with a dagger, which can be used to silently kill guards instead of attracting attention with gunfire. Additionally, the audio system includes an increased vocabulary and greater variety of sound effects. Upon successful completion of the game, the player is rewarded with a high resolution graphic of the bunker exploding in the background, with the player running away in the foreground. Antic in 1985 stated that the Atari 8-bit version of Beyond Castle Wolfenstein "promises more than it delivers in strategy," and also that "while there have been some minor improvements, the game play doesn't provide nearly as much depth as the documentation suggests." The magazine criticized the game for having the same Apple II-like graphics as its predecessor, slow loading speed, and apparently unnecessary features; "Once you know which passes to use, you can breeze through the game", discouraging replay. A 1991 Computer Gaming World survey of strategy and war games gave it two stars out of five. ^ Loguidice, Bill; Barton, Matt. Vintage Games: An Insider Look at the History of Grand Theft Auto, Super Mario, and the Most Influential Games of All Time. CRC Press. ISBN 9781136137587. Retrieved 29 August 2016. Atari Computer Enthusiasts. March 1985. Video Game Update. July 1984.